Brigitte Jurack (born Duesseldorf, 1962) studied at Kunstakademie Duesseldorf, Glasgow School of Art and Chelsea College of Art & Design in London. As an artist, Jurack looks at the world as it is and tries to make sense of it; her process could be described as picking up what is already out there. The material and non-material outcomes of what actually appears in the studio or exhibition are driven by the desire to create and hold on to the elusiveness of visual sensations. Jurack has exhibited widely, including Irish Museum of Modern Art (Dublin), European Ceramic Work Centre (Hertogenbosch) and The 3rd World Water Conference (Kyoto). She was the 2002 Henry Moore Sculpture Fellow and was nominated for the 2014 Liverpool Art Prize. 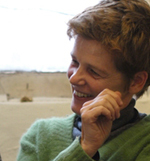 She is currently Head of Sculpture at Manchester School of Art, where she is undertaking a practice-based PhD. The research considers the connections between sculpture and play and included a study period at the British School in Athens under a Prince of Wales Bursary. Jurack is also founding member of the artists' group Foreign Investment who have exhibited in Rio de Janeiro, Kiev, Hong Kong, Oslo, Berlin and the Istanbul and Venice Biennials. See www.foreign-investments.com.